Setting up your own nano reef can be quite simple and is almost the same as a traditionally sized reef. This article will go over the basics of setting up a nano reef, as well as the equipment that is necessary. To start, you will need to pick out the aquarium you would like to use. Three good starter sizes are the standard 10 gallon, 15 gallon, or 20 gallon aquariums. Next, you will need to decide on the lighting system you want to use. Powercompact retrofit kits and canopies are highly recommended. These powercompact lamps will provide your nano reef with plenty of light for many types of corals. 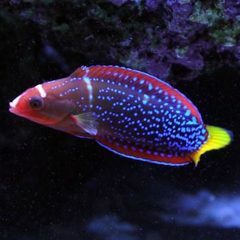 For the heater, I highly recommend using a 50w or 75w Ebo Jager brand heater, as users of these have consistently had success in such small aquariums. Lastly, you will need a small powerhead pump for circulation. I have found Aquarium System's Mini-Jet pumps to be quiet and reliable, but all other similarly sized pumps will work. For your filtration it's recommended to use an all natural method. Good quality live rock and live sand are the key to a successful system. You will want to use at least one pound of live rock per gallon, and about one-half pounds of live sand per gallon. More information on this can be found in the filtration article. When you look for a location to place your nano reef, you will want to keep a few things in mind. The tank should be placed on a level and sturdy surface that can support approximately 70-250 pounds depending on the size of the tank. You will also want to place it in a high traffic area where it will be seen often, so you do not forget to feed it or do maintenance work when necessary. 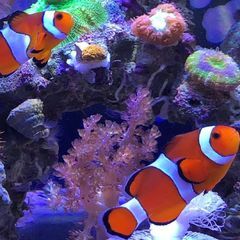 When the time comes to fill the tank and get it running, you will need to have purchased a good synthetic reef salt and a specific gravity meter. Swing-arm or floating hydrometers can be purchased for under $10 and will provide a basic reading of the specific gravity. A more expensive refractometer is however recommended for highly accurate readings. Fill the tank with water and add salt until the specific gravity is 1.023. Place the powerhead in immediately so it will help mix the salt. Now is also the time to place in your heater and get the water temperature to 78 degrees. Once your s.g. has reached it's proper level, you can add the live rock and live sand. Place the live rock in first, using an open pattern so the fish have room to swim through and hide in the rock. Be as creative as you want during this process and don't be afraid to go back and change it later. Once the rock is where you like it, you can pour the live sand around the rocks, keeping it at a fairly even thickness throughout the tank. Next comes your livestock! Please see the Nano Reef Critters article. A nice intro to this aquarium world! Adding live sand after the water and live rock are already in the tank may create a nasty suspension of small grain sand particles. Does it make sense to first lay the sand bed, followed by placing the live rock, and then slowly introducing the water? If one cycles with bulk dry rock, this option may work, but I don't know how it will affect pre-cultured wet live rock. yes please!! I am just getting ready to set up my 10g nano and would love updated recommendations on thermometer and best quiet power heads. I've already decided to go with a Kessil A80 light. I will also be going the natural filtration route, as my current 28g tanks runs that way. As I am breaking that one down, I will be transferring the sand and some rock to my nano. I'm still learning to navigate this site, so maybe all this is already addressed elsewhere?? I believe placing the rocks first then adding the sand is to prevent the rocks from collapsing on any diggers or burrowers. However, I agree with adding the water after the live sand. I have over 40 years experience with FW and absolutely none (at this point) with SW. But the concept of setting up those 3 elements would be the same.